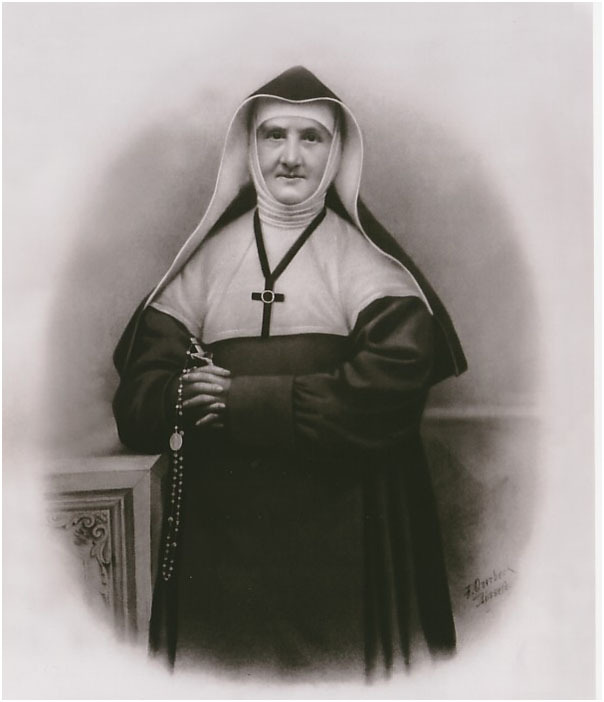 Mother Marie Therese (Jeanne Haze), the Founderess of the Daughters of the Cross was born in Liege on 28th February 1782, into a happy united Christian family living in easy circumstances. Her father was secretary to the Prince Bishop of that period. It was this fact which drew the attention of the revolutionary armies of 1794, a year which marked of beginning of sorrows of Jeanne. The family was forced to flee, first else where in Belgium, then further afield into neighbouring countries. In the panic some of the children were separated from their parents. The father w2ornout by anxiety and fatigue died in exile.When the mrest of the family were able to return to Liege their situation was daunting for little if anything ,was left of their home and possessions.The only son continued his law studiesbut died suddenly.just after having qualified to begin exercising his profession.The mother and her daughters eked out a hand to mouth existence,struggling valiantly to survive in the war-torn society of the Revolutionary wars,and their aftermath in Belgium. Whilst their other sisters married and were busy settling their own households,Jeanne and her sister Ferdinande decided not to marry,but remained with their mother until her death.The two sisters then lived a secluded life,devoting the greater part of their time and means to caring for the poor.When a friend of theirsdecided to enter a convent ,They were responsible for the small fee paying school which she had been running.This assured a lively hood.But when a little later they were asked to takeover the poor school in the parish of St.Barthelemy in liege,inspite of the protests of family and friends they accepted and gaveup this little school,thus facing once more the insecurity of poverty. This was a decisive turning point in Jeanne’s life.After the years of trial and sorrow,it was the cross that attracted her as the outstanding sign of the everlasting love of God for each of his children.Shye felt drawn to respond to the prodigal, generous love by seeing and serving Christ in all she met.Why did she not turn to religious life?The French Revolution has closed the conventsand dispersed the religious.The successive governments were equallyunfavourably disposed and Belgium, under the rule of the Dutch,entry to Religious orders were forbidden by law. Because Jeanne Haze could not find around her the means for which she was searching slowly the idea of a new foundation took shape.She was ready for whatever the service of God demanded,fashioned as she was by suffering ,and entirely open to the will of God and the needs of her environment,in faith and hope she went ahead with the idea of a new religious family .Besides her sister Ferdinande,three other companions shared her hopes and desires.A young curate of the parish John William Habets,consented to be the spiritual director of the little group,though at an outset ,he strongly opposed a new foundation,he eventually threw himself into the idea with all his heart. The Belgium Revolution of 1830,and the ensuing independence of the country which followed,changed everything,and made possible much that had hitherto been forbidden .The new Congregation began on September 8th 1833,when Jeanne Haze,to be known hence forth as Mother Marie Therese, and her companions pronounced their vows,becoming Daughters of the Cross,the title she had long since chosen.. Beginnings are rarely easy .The faith of the foundress, already in her early fifties, was soon to put to the test when three of her first companions died within two years of Foundation, and a gifted but misguided novice endeavoured to supplant her as Foundress. In spite of all this, vocations multiplied and the little congregation made rapid progress. Teaching, the original occupation, was soon followed by caring for the sick in their homes, for orphans who had to be provided for and for girls and women in moral danger or in prison, who needed help. This early diversification of works was a mark of the spirit of Mother Marie Therese, who was ready to meet all the needs that were addressed to her, whether these were permanent such as those mentioned above, or temporary, such as the care of those stricken by the cholera epidemics of Liege of 1849 and 186, or of the wounded of the battlefields of 1866 and 1870. As early as 1851 the Congregation spread into Germany. In 1862 the first sisters sailed for India and in 1863 a group set out for England. Wherever mother Marie Therese wished to send her daughters, she found a way. From the beginning she had the indefatigable support of the young Fr.Habets,later to become a Canon involved in important diocesan works,but finally entirely devoted to the care and promotion of the congregation .He can perhaps be considered as co-founder,for without him Mother Marie Therese would not have been able to set on so many foundations. They died in the same year,1876,Mother Marie Therese on January 7th and Canon Habets on 29th December. The Congregation has continued to spread and to reply to many needs. At present, in addition to the countries mentioned above,there are houses in Italy, Ireland, the United States, Pakistan, Zire and Brazil.